Old couches, sofas, loveseats and other household furniture can be a real pain to get rid of all on your own. Well you don’t have to worry about that pain and stress any longer. 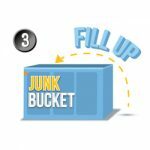 The answer to getting rid of your old couch and other household furniture is simple now, The Junk Bucket. The Junk Bucket Dumpsters make getting rid of that old junk couch in your basement simpler than ever. 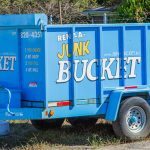 All you have to do is follow these simple steps to renting & using a Junk Bucket. 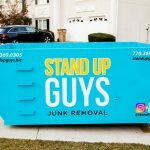 First, call up to our Stand Up Guys Junk Removal Headquarters and let us know what day and time you would like a Junk Bucket Dropped off. 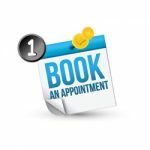 Or you can even schedule that appointment online,whatever is easiest for you. When the day comes that you scheduled your Junk Bucket drop off, you will receive a call 30 minutes prior to your drivers arrival at your home. This is just a simple courtesy call to let you know we are on the way. So you can be as prepared as possible. Once the driver arrives with your Junk Bucket, simply let them know where you would like it placed. The Junk Bucket Dumpsters aren’t like other dumpster rental companies roll-offs. 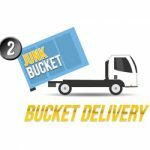 No, Junk Buckets are sleek, slender, mobile and driveway safe. This means you can have your Junk Bucket dropped pretty much anywhere you like. The closer your dumpster is to your junk issue, the less walking you have to do. This, in turn, means less work on your part. Once the Junk Bucket is placed exactly where you’d like, then it’s time to get to work. You can fill the Junk Bucket with whatever household junk you have. You don’t have to be limited to just throwing away you couches or sofas. You can chuck those in there, then pile on more and more junk, until you are satisfied with how much you have tossed out. Cleaning out the clutter can be a great feeling. Now that you have cleaned the space out of your home that you wanted. Along with chucking all the junk and trash away into the Junk Bucket. The sweaty part is over. All you have to do from this point is pick up the phone and let us know that you are ready to have your Bucket picked up. 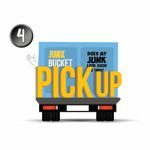 Once we get the call that you are done with your Junk Bucket, we send a truck over right away to scoop it up and haul away all your junk. Again, the driver will give you a call 30 minutes prior to arrival, as a heads up. Once they get there, they will hook up the Bucket, tarp it off and haul everything away. It’s all really that simple. 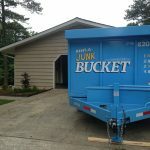 Renting a Junk Bucket Dumpster to get rid of your old junk couches and other household junk is the easiest way for your DIY’ers to remove junk and household debris. You can’t beat a Junk Bucket!